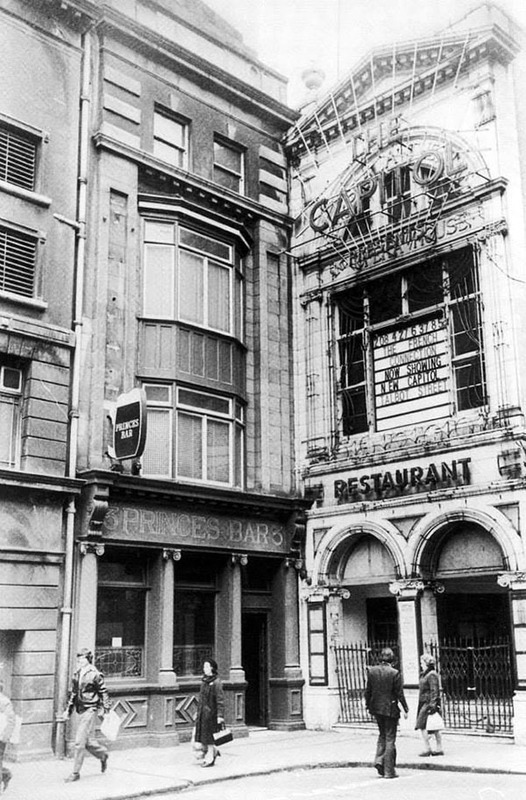 The Capitol Theatre, located just off O’Connell Street, Dublin, began life on 10 August 1920 as the La Scala Theatre and Opera House. Constructed on the former site of Freeman’s Journal offices, which was destroyed during the 1916 Easter Rising. In 1927 Paramount, the Hollywood movie company, took over the lease and renamed it as “The Capitol”. They wished to have an outlet for their movies in the centre of Dublin. The building had a restaurant, a cafe, a lounge bar and a ballroom – a complete entertainment venue. The Theatre itself had two balconies and many private boxes and could seat 1,400 people. Continued as a cinema until 1972, when it was demolished along with the adjacent Metropole Cinema to make way for a branch of the department store chain British Home Stores. According to legend, the wood panelling and interior doors of the Theatre came from Belfast where they had been made in preparation for installation in the liner Britannic. However at the commencement of the 1914-1918 war the ship was detailed for use as a troop carrier and was sunk in 1916 during the war. A similar story exists about The Oak on Dame Street, this time the ship was the Mauritania.